While finishing a portrait session in Beaver, PA near the museum, I noticed the clouds coming together in the far distant right. 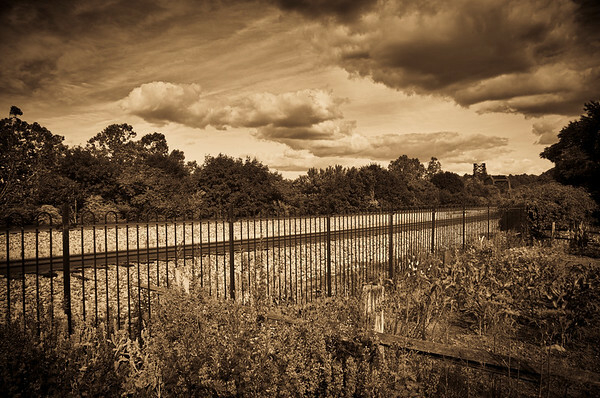 The lines of the fence converged with the tree line to meet with the cloud lines all around the railroad bridge as it crossed over the river. This was late evening and the sun was playing peek a boo with me. Therefore, I decided to utilize an HDR technique and grab 5 exposures of the scene to create this image. A quick post today - As always - get out and enjoy the beauty of life around you. There are hundreds of places I want to photograph in my neighborhood before winter that present an amazing look. Take the time and find some in your area and make a great image!